As if arriving to FedEx Field was hard enough for Redskins fans, most of them had to bear witness to seeing at least 50% of the stadium filled with Green Bay Packers fans. Most of the Packers fans confidently strutted and yelled out their chant of “Go! Pack! Go!” as they walked along the wet concourse and then eventually finding their seats. Redskins fans seemed to mill about looking relaxed and at ease with what seemed like the predetermined result of a beating by the hands of a mighty franchise like the Packers. Redskins fans seemed to think more existentially with questions like: “Would it be a close game?”, “Would the Packers show mercy?”, and “Does it really matter?” But deep down inside Redskins fans seethed contempt for the Packer faithful and wanted nothing more than to silence these braggarts and teach them what it’s like to feel real disappointment, feelings that Redskins fans know all to well. As folks made it to their wet seats the game began with chants of “Go! Pack! Go!” and Redskins fans silently seethed but kept quiet since there were so many Packers fans there. 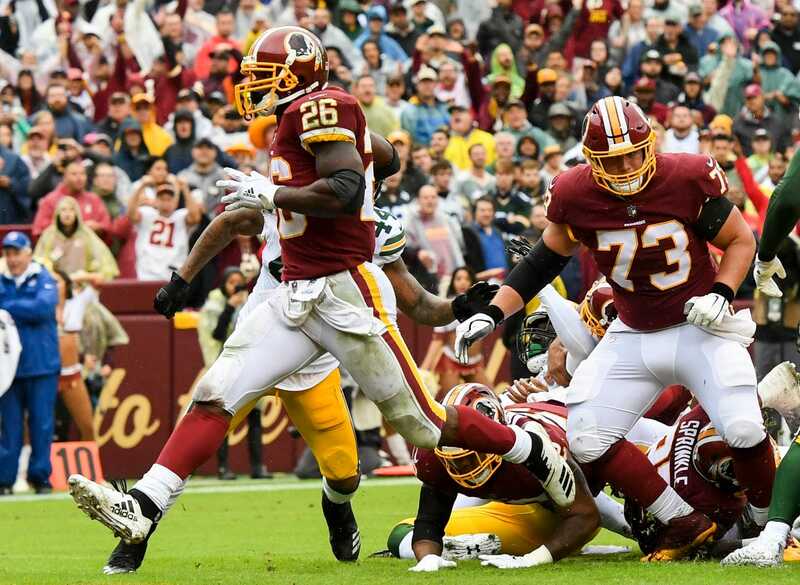 The Packers lost the coin toss and deferred and the Redskins came out shooting out of the gate after a couple of plays with a great catch and run by TE Vernon Davis that showed the Redskins were more prepared this week than last. Then right after that big play, the Redskins went for another big play when QB Alex Smith threw the ball deep toward the end zone and let WR Paul Richardson Jr. make a great play and was able to throw himself into the end zone for a shocking 7-0 start. Packers fans looked around in agony for someone to answer for this unbelievable beginning, as Redskin fans joyfully sang “Hail to the Redskins” and jumped around wildly. 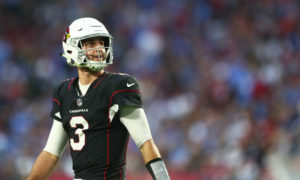 The Redskins fans could smell the weakness in QB Aaron Rodgers’ gimpy leg in the following series and could begin to sense that an upset was brewing. The rain precluded that the running game would be something to be relied on and RB Adrian Peterson seemed up to the task as he made some excellent runs on the next scoring possession that ended with Peterson walking into the end zone seemingly untouched to make it 14-0. Redskins fans don’t actually feel confident until a Redskins lead is almost insanely large. It wasn’t until the 3rd scoring drive that started at the Redskins own 2 yard line that one could feel the momentum rising in the stadium. A big catch and run by TE Jordan Reed, and then a monstrous 41 yard run by Peterson set the table for WR Jamison Crowder’s 9-yard touchdown catch between multiple defenders which let the fans take in a large breath and enjoy the game’s hopeful outcome. It was at this point that the “Go! Pack! Go!” chants began being mocked by Redskins fans and eventually turned into a “Go! Pack! Go home!” chant and finally morphed into its final incantation of “Go! Back! Home!” Redskins fans were a joyous bunch with 21-3 lead. 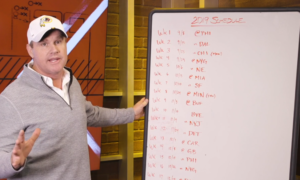 The Packers would try to mount a comeback but they dropped too many important balls on 3rd down and the Redskins defense knew that the Packers would have to become one dimensional in the process. With future Hall of Famer Rodgers leading the way, it is always in the realm of possibility. But, by the end of the first half the Redskins had answered the one threat the Packers made and maintained a decisive lead of 28-10. 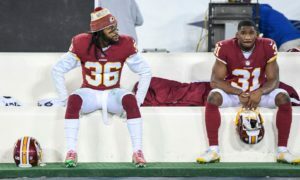 The second half was mostly time wasting by both teams as the Redskins defense finally feasted on a turnover by Packers WR Randall Cobb in the 4th quarter which resulted in the last score of the game with a field goal by K Dustin Hopkins to make the final score 31-17. The Redskins fans who tend to only sing “Hail to the Redskins” for touchdowns or when they take the lead in close games on field goals got a hilarious surprise after the final field goal that showed that maybe the front office is listening to the fans in regards to entertainment by playing this song, click here to hear it. It was a Korean baseball version of “Hail to the Redskins” and everyone loved it, or least everyone in Section 223 did. In the past week as Redskins fans all agreed that the stadium experience isn’t ideal and might be one of the worst in the league. What might change loyal fans opinions, would be victories like this, which lead to an opportunity to mock the visiting team’s chants, and along the way get to hear a new take on an old favorite. It’s not always the song that needs to change but its tune. Let’s see if the Redskins can keep the beat going after a bye week.